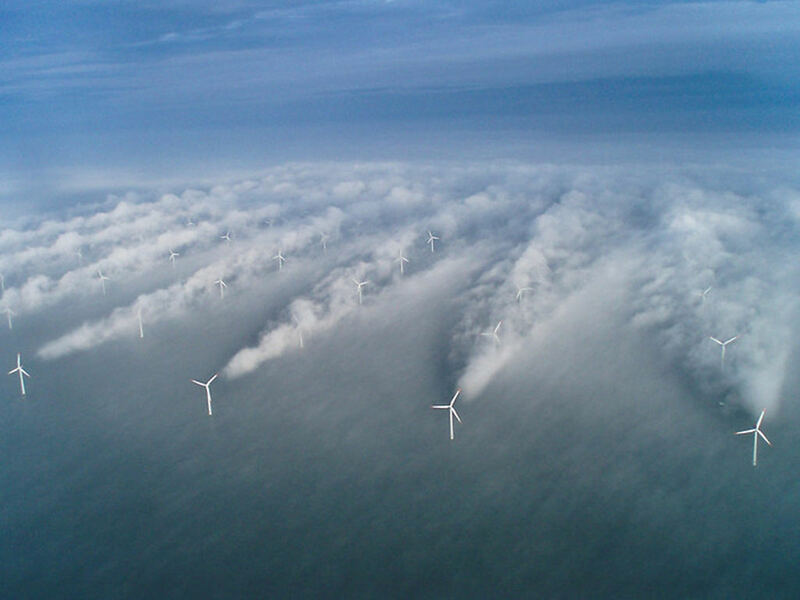 Airline pilots are blaming spreading wind farms, particularly in the North Sea, for increased discomfort when making their approach into Britain. According to Captain Mike Searle of BALPA, the British Airline Pilots Association, turbulence from the vortices thrown up by the whirling blades can be clearly seen streaming across the sea. "The real problem is that most of the turbulence is invisible; it's only when condensation forms, that you see the trails, and how far they spread." Climate scientists have also pointed out that mushrooming wind farms actually sap the atmosphere of energy, and act as seed points for increased cloud formation. This indirectly leads to further increases in the greenhouse effect, possibly aggravating global warming, and affecting regional weather. "We've always had to deal with extreme weather," says Searle, "but now it seems that these forests of wind turbines are making it even more difficult, and unpredictable. I think they should be banned, for safety's sake!" The airline industry is already in a spin, particularly in Europe, where the compulsory carbon tax on airlines has had a massive recessionary impact. Chinese and Indian airlines are again threatening to boycott EU skies. British and European airlines are bound to see competitors from the Gulf, with their subsidized fuel, gain more ground. I guess there comes a time to check whats in store for other renewable power sources. Hope "Solar" is much more trouble free. Despite mounting criticism and even active protests against wind farms and their environmental impact, Germany is expanding its portfolio, both offshore and onshore, and in neighbouring countries. Having abandoned nuclear power, I suppose they need to fully exploit all other options. Tags: Aerospace Airlines Climate Change Energy Environment Transport Travel Click on any tag to find more MindBullets on that topic.